Introduces both the spoken and the written language. The course emphasizes oral expression and listening comprehension; it is designed to give beginning students a practical command of the language. Topics covered include phonetics, grammatical gender, the nominative and prepositional cases, possessive forms, and introduction to verb conjugation. Communicative tasks will include: introducing yourself and others, talking about where you live and work, and naming and describing common objects such as clothing. Introduces the accusative case, basic motion verbs, the past tense, and the days of the week and times of day. Students will be able to describe their daily activities as well as express what they have, want, and need. Communicative tasks will focus on hobbies, daily schedules, food, and furniture. With the introduction of the genitive case, students will be able to express absence and attribution. Students continue building fluency with the verbs of motion, subjectless expressions, sentences of necessity and possibility, and some expressions of the future tense. Communicative tasks include making requests (in stores, restaurants) and solving problems created by absence. Focuses on additional uses of the dative case and its forms, the accusative animate, short form adjectives, and verbal aspect. Topics include family, age, phone conversations, and physical and personal characteristics. Communicative tasks include describing friends and family, initiating and ending phone calls, and narration that contrasts past habits with present actions. Introduces the instrumental case and continues work on verbal aspect and verbs of motion. Topics include health, holidays, and free time. Communicative tasks include going to the doctor, exchanging holiday greetings and making toasts, and planning holiday meals. With the introduction of the genitive plural, students will have experience with all six cases. Students will progress to basic prefixed verbs of motion and the corresponding prepositions. Communicative tasks include describing a city or country, talking about transportation, and describing a trip or plans for a trip. This is a program designed for students who already have a good command of the language. It works well for students of varying backgrounds and interests in Russian, including those who were born into a Russian-speaking family but have had no formal education in the language. Conducted entirely in Russian, the course can be tailored to fit the interests of the students. The chief aim of the course is to develop conversational skills by focusing on communication strategies, including the use of computer software and topical videos. Over the past thirty years, we have reviewed many university-level Russian textbooks and have selected Beginner’s Russian (A. Kudyma, F. Miller, O. Kagan; Hippocrene Books) as the one that best fulfills the objectives of our students in beginning and intermediate levels. Teachers provide suggestions for texts and supplementary materials at the higher levels. 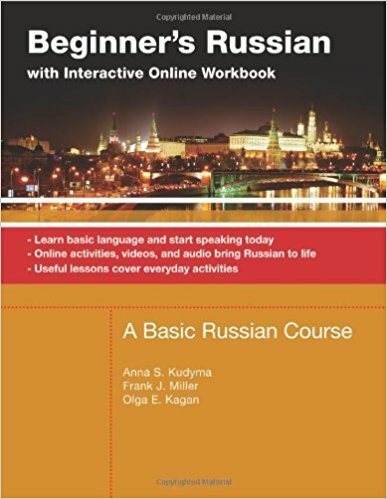 Currently, Beginner’s Russian can be purchased online through Amazon or through the Barnes and Noble Boston University Bookstore at 660 Beacon Street, Boston. Tuition for the Russian program at all levels is $379. There is a non-refundable $35 registration fee for first-time students only.